We recommend enabling CORS (Cross-Origin Resource Sharing) when using Amazon S3 as your backend server. 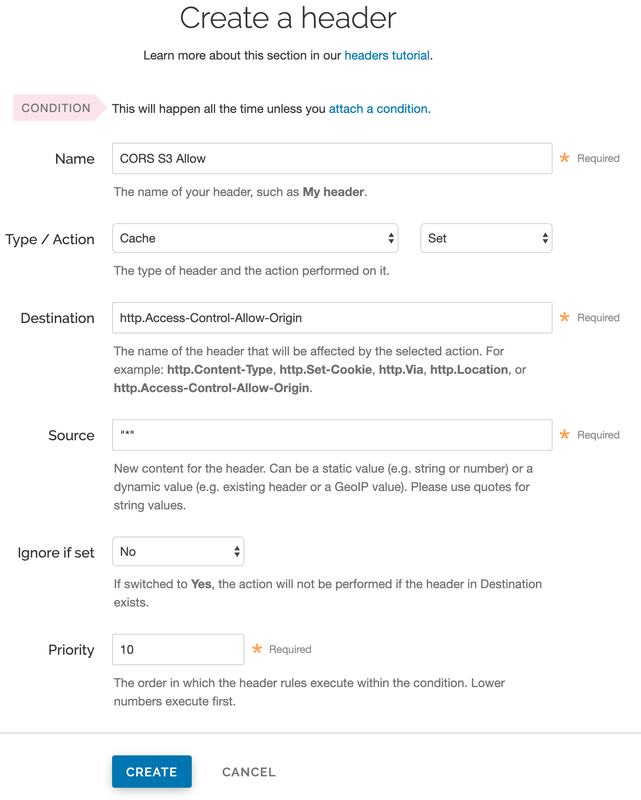 To enable CORS, set up a custom HTTP header for your service by following the steps below. In the Name field, type a descriptive name for the new header (e.g., CORS S3 Allow). This name is displayed in the Fastly web interface. In the Destination field, type http.Access-Control-Allow-Origin. In the Source field, type "*". Leave the Ignore if set menu and the Priority field set to their default values. Click the Create button. The new header appears on the Content page. IMPORTANT: Objects already cached won't have this header applied until you purge them.